In The Noblest Triumph, Tom Bethell looks at the history of property rights and shows that the key role played by the institution of private property has been misunderstood by Western elites for more than a century. Beginning with the ancient Greeks and arriving at the present day, Bethell looks at basic ideas about property found in the writings of Plato, Adam Smith, Blackstone, Bentham, Marx, Mill, and others. He shows that the institution of property is inextricably tied to traditional conceptions of justice and liberty, and he argues that prosperity and civilization can only arise where private property is securely held by the people. 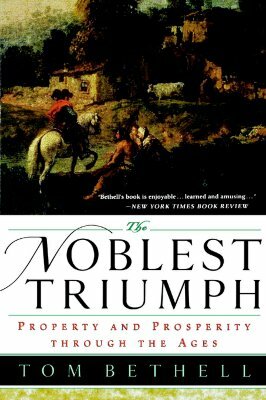 The Noblest Triumph is an indispensable book for anyone interested in this fundamental aspect of civilization and the progress of humankind through the ages. Tom Bethell is the Washington, DC correspondent for "The American Spectator"and a visiting fellow at the Hoover Institution, Stanford University.